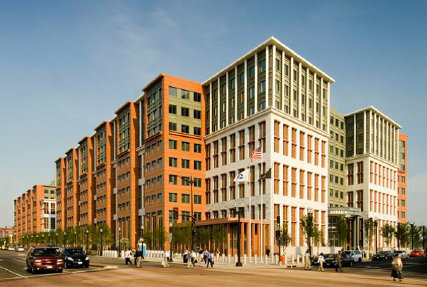 The Department of Transportation Headquarters building, completed in 2007, is the first new cabinet-level headquarters building constructed in Washington, DC in over 30 year. Encompassing two city blocks, the development includes two towers – one 9-story and one 8-story – connected by a multi-story lobby and atrium, lending to its open feel. But while the building may give the feel of easy accessibility, it is actually constructed in accordance with the GSA Progressive Collapse Analysis and Design Guidelines for New Federal Office Buildings and Major Expansion Projects 2003, including resistance to blast pressures. Tidewater Glazing was contracted to provide over 130,000 square feet of blast resistant punched windows and twin-story punched curtainwalls, engineered to provide appropriate resistance during a blast event. This included a high-span, monumental main entrance with faced, stainless steel clad framing. In addition to the exterior façade, there was an additional 40,000 square feet of interior atrium glazing. 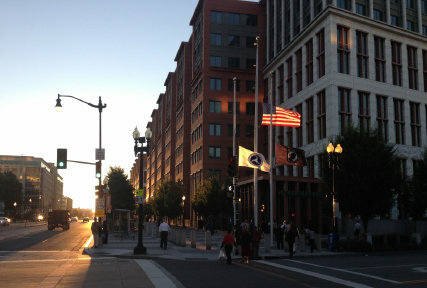 Once completed, the project was awarded LEED Gold certification.